Elegant French lace pattern. We finished in a simple design flare dress dress. The fabric is 100% cotton. There is moderate thickness and softness, it can be worn in one piece. Recommended piece for going out. ▼ I made a short sleeve type ♪ → https://jp.pinkoi.com/product/YereBnhM ▼ 2 colors color variations ▼ 【blue-black】 ※ Please order from each product page, respectively. Blue is here → https://jp.pinkoi.com/product/qqadeRve Free Size (One Size) ▼ Length (from back center to hem): 96 cm Width (straight line connecting left and right side and side): 46 cm Width of cuff: 14 cm Because it is a French sleeve, you can wear it without worrying about the shoulder width. ※ For convenience of the design, the size of the shoulder width and sleeve length is not displayed. We do not accept returned goods etc due to reasons such as not entering, do not come nicely. 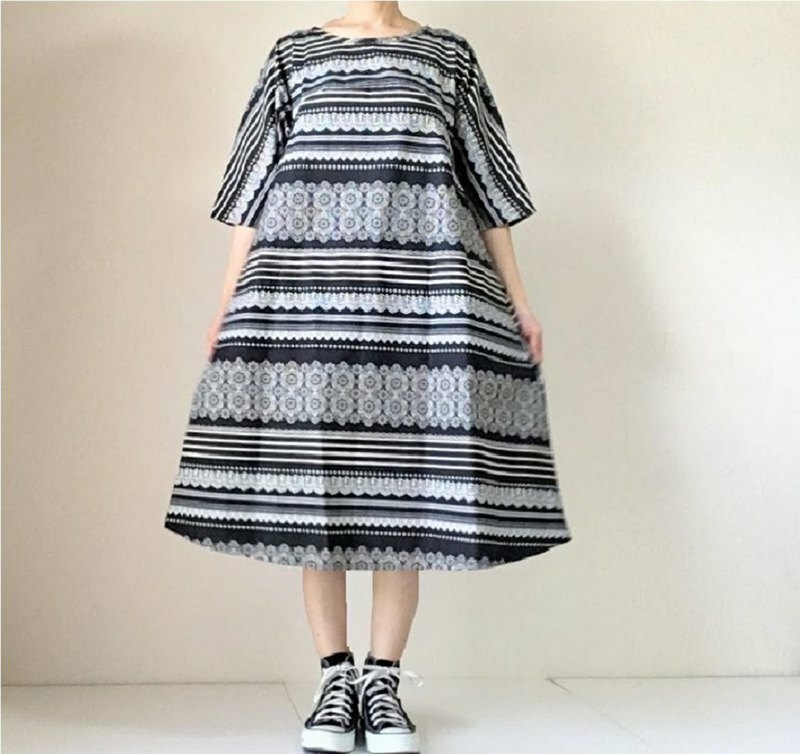 (Size can not be changed) Recommended for pregnancy ♪ Model height 150 cm ▼ Material ▼ 100% cotton without lining Put it in the net, washing at home OK. Dryer impossible. Due to the nature of the fabric, washing causes wrinkles and shrinkage.